Create professional Flash multimedia slideshow. 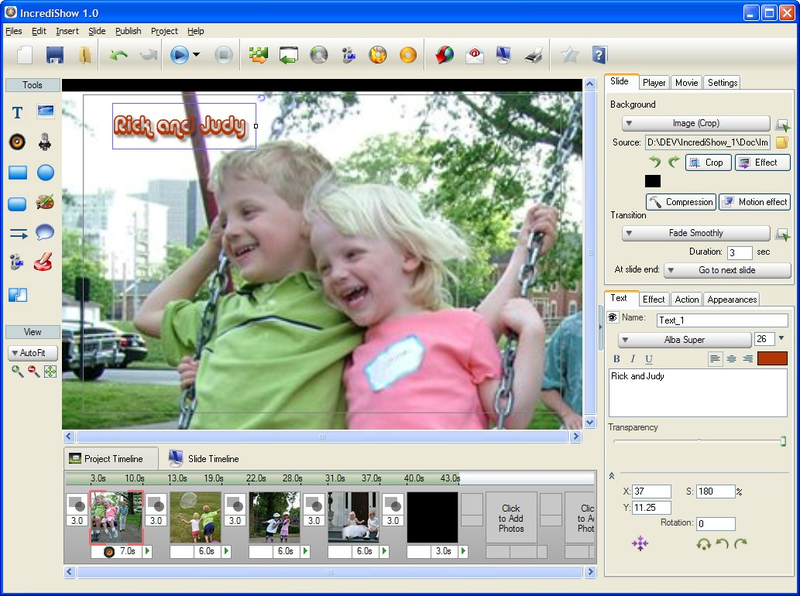 Blend your photos, Flash movies, music, text animation and videos to produce impressive multimedia slideshows. Great to promote your business, proofing images for clients or wowing any audience. 200+ highly customizable transition effect. Create more impresive slideshow with Pan and Zoom Motion (Ken & Burn) effect, stunning text animation, more build-in clipart library to cater most themes. Adjust the timing of each object's animation and sound's playback precisely and easily using timeline window. Waveform preview enables you to synchronize music, sound and visual element. Add interactivities such as click to play sound, click to show/hide visual objects, etc. Import MP3/OOG/AVI/WMV/MPEG/GIF animation files. Add and choose playback control. Publish your slideshow as Flash movie, executable file/CD/screensaver with registration, usage limit and full application installer. Send via e-mail using free IncrediShow online service. It has been tested and works on Windows Vista. Support more than one background music, multiple font setting, font style. More seamless looping sound. And better preloader system. Publish to MPEG4, Quicktime movie and wireless device video format such as IPhone, IPod, PSP and mobile phone.